ROCHESTER, N.H. – It seemed like a good idea at the time: give away a free attack rifle or handgun with every used car buy. That was Mike Hagan’s brainchild to boost his sales in gun-conscious America. Hagan owns Hagan’s Motor Pool and Auto Repair and Sales in Rochester, New Hampshire. He hatched the promo in May, but it got more attention than he bargained for when Omar Mateen used an attack rifle to murder 49 gays and lesbians in an Orlando, Fla., nightclub in June. “To me that’s just getting more of the nutjobs out to do even more harm to people that don’t deserve it,” Jen Marks, a Rochester resident, told the local TV station. Hagan, an Afghan war veteran, said the sale is done in conjunction with a local firearms store that completes the required background checks. 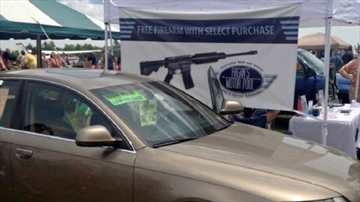 Customers buy the weapon then bring the receipt to the car dealer. AR-15s retail at about US$500. But his sales may have got a boost with the jump in gun sales that inevitably follow talk about gun control in the U.S. The dealer told the local TV station the promotion has increased car sales. The Associated Press reported that Hagan has given away four AR-15s and one 9 mm handgun, which Hagan also offers if customers decline the rifle. “We’ve had spectacular reception, even after what’s happened,” he said. “It’s absolutely helping out sales — whether or not people like what we’re doing,” he said. Following the mass shooting at Pulse, Hagan briefly considered changing the offer — but after speaking with community members, he decided against it. With files from the Hamilton Spectator and the New York Daily News.